CLICK HERE to listen to episode audio (4:14). All Web addresses mentioned were functional as of 3-16-18. From the Cumberland Gap to the Atlantic Ocean, this is Virginia Water Radio for the week of March 19, 2018. This week, we revisit a 2012 episode featuring music about an American Civil War battle on the waters of Virginia’s Hampton Roads that was indecisive at the time but had long-term naval consequences. Have a listen for about a minute. You’ve been listening to part of “The Cumberland and the Merrimac,” performed by Tom Roush. The song tells the story of a new naval era dawning—right in Hampton Roads. On March 8, 1862, the ironclad CSS Virginia—often called the Merrimac [or Merrimack], because it was constructed upon that wooden ship’s salvaged hull—attacked a Hampton Roads blockade to restore maritime access to Richmond and Norfolk. With its armor deflecting Union shots, the Virginia sank the USS Cumberland and forced the surrender of the USS Congress. When the Union’s ironclad ship, the USS Monitor, arrived the next day to defend the blockade, the historic “Battle of the Ironclads” ensued. Though no clear winner prevailed in that battle, the emergence of the Civil War ironclads forever changed naval warfare. As for Hampton Roads, one hundred and fifty-six years later the area maintains its relevance as a hub for trade, shipbuilding, military bases, and, of course, history. This Virginia Water Radio episode was originally written by Heather Vereb in March 2012. The episode replaces Episode 104, 3-26-12, which has been archived. The origin of the tune and lyrics of “The Cumberland and Merrimac” are anonymous. The version of the song heard in this episode was arranged and performed by Tom Roush, used with permission. The full performance of the song by Mr. Roush is available on You Tube at https://www.youtube.com/watch?v=DEY62qOSnAA. More information about Mr. Roush is available online at http://tomroush.us/. The following images were accessed at the Web site of the U.S. Navy/Naval History and Heritage Command, “The Battle of Hampton Roads,” online at https://www.history.navy.mil/our-collections/photography/wars-and-events/the-american-civil-war--1861-1865/css-virginia-destroys-uss-cumberland-and-uss-congress--8-march-1.html. 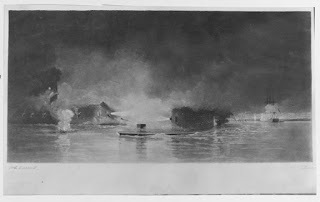 “Iron versus Wood: Sinking of the Cumberland by the Merrimac. In Hampton Roads, March 8, 1862.” Oil painting by Edward Moran (1829-1901). Accessed online at https://www.history.navy.mil/our-collections/photography/wars-and-events/the-american-civil-war--1861-1865/css-virginia-destroys-uss-cumberland-and-uss-congress--8-march-1/80-g-k-17106-iron-vs-wood.html. 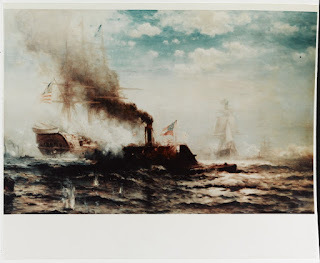 “Battle between USS Monitor and CSS Virginia in Hampton Roads, Virginia, 9 March 1862.” Lithograph by Closson Blake, after a painting by W.F. Halsall. Accessed online at https://www.history.navy.mil/our-collections/photography/wars-and-events/the-american-civil-war--1861-1865/css-virginia-destroys-uss-cumberland-and-uss-congress--8-march-1/nh-1053-battle-between-uss-monitor-and-css-virginia-in-hampton-r.html. “At mid-day on 8 March 1862, CSS Virginia (formerly USS Merrimack, and persistently mid-identified by that name or as ‘Merrimac’) steamed down the Elizabeth River from Norfolk and entered Hampton Roads. It was the newly converted ironclad's trial trip, a short voyage that would deeply influence naval opinion at home and abroad. “Virginia backed clear, tearing off most of her iron ram, and slowly turned toward the Congress, which had gone aground while trying to get underway. Confederate gunners put several raking shells into the frigate’s hull, and maintained a relentless fire as they came alongside. After an hour’s battle, in which Congress’ crew suffered heavy casualties, she raised the white flag of surrender. As the Confederates began to take off her crew, several men on both sides were hit by gunfire from ashore, among them the Virginia’s Commanding Officer, Captain Franklin Buchanan, who ordered Congress set afire with hot shot. She blazed into the night, exploding as the fire reached her powder magazines about two hours after midnight. “Virginia had meanwhile made a brief demonstration in the direction of the big steam frigate Minnesota, which had also gone aground. However, with the day’s light about to fade, the ironclad turned back toward the southern side of Hampton Roads and anchored. Though two of her guns had their muzzles shot off and most external fittings were swept away or rendered useless, she had dramatically demonstrated the horrible vulnerability of unarmored wooden warships when confronted with a hostile ironclad, and was still battleworthy…. “At dawn on 9 March 1862, CSS Virginia prepared for renewed combat. The previous day, she had utterly defeated two big Federal warships, Congress and Cumberland, destroying both and killing more than 240 of their crewmen. Today, she expected to inflict a similar fate on the grounded steam frigate Minnesota and other enemy ships, probably freeing the lower Chesapeake Bay region of Union seapower and the land forces it supported. Virginia would thus contribute importantly to the Confederacy’s military, and perhaps diplomatic, fortunes. “However, as they surveyed the opposite side of Hampton Roads, where the Minnesota and other potential victims awaited their fate, the Confederates realized that things were not going to be so simple. There, looking small and low near the lofty frigate, was a vessel that could only be USS Monitor, the Union Navy’s own ironclad, which had arrived the previous evening after a perilous voyage from New York. Though her crew was exhausted and their ship untested, the Monitor was also preparing for action. “Undeterred, Virginia steamed out into Hampton Roads. Monitor positioned herself to protect the immobile Minnesota, and a general battle began. Both ships hammered away at each other with heavy cannon, and tried to run down and hopefully disable the other, but their iron-armored sides prevented vital damage. Virginia’s smokestack was shot away, further reducing her already modest mobility, and Monitor’s technological teething troubles hindered the effectiveness of her two eleven-inch guns, the Navy’s most powerful weapons. Ammunition supply problems required her to temporarily pull away into shallower water, where the deep-drafted Virginia could not follow, but she always covered the Minnesota. “Soon after noon, Virginia gunners concentrated their fire on Monitor’s pilothouse, a small iron blockhouse near her bow. A shell hit there blinded Lieutenant John L. Worden, the Union ship's Commanding Officer, forcing another withdrawal until he could be relieved at the conn. By the time she was ready to return to the fight, Virginia had turned away toward Norfolk. History.com, “Battle of the Ironclads,” online at https://www.history.com/this-day-in-history/battle-of-the-ironclads. U.S. Navy/Naval History and Heritage Command, “The Battle of Hampton Roads,” undated, online at https://www.history.navy.mil/our-collections/photography/wars-and-events/the-american-civil-war--1861-1865/css-virginia-destroys-uss-cumberland-and-uss-congress--8-march-1.html. All Water Radio episodes are listed by category at the Index link above (http://www.virginiawaterradio.org/p/index.html). See particularly the “History” subject category. Following are links to some other episodes on the role of waterways in the Revolutionary War and the Civil War. Revolutionary WarEpisode 168 – 7/1/13 – Revolutionary War Waters. Episode 220, 6/30/14 – Water origins of the Virginia signers of the Declaration of Independence. Episode 273 – 7/6/15 – Taking “The Great Road” by Timothy Seamn on an Independence Day Journey to the Virginia Peninsula and Historic Triangle. Episode 390, 10/16/17 – History on the York River, Featuring “The Surrender of Cornwallis” by Bobby Horton. Episode 101, 3/5/12 – “All Quite Along the Potomac Tonight,” by Bobby Horton. Episode 164, 6/3/13 – “Richmond is a Hard Road to Travel,” by Bobby Horton. Episode 318, 5/30/16 – Memorial Day’s Origin, from a Potomac River Perspective. USI.9 – causes, events, and effects of the Civil War. VUS.7 - knowledge of the Civil War and Reconstruction Era.